The midfielder had played for France at junior level but switched allegiances under Fifa rules. And the 19-year-old made his debut for Algeria against Slovenia in March. "I think he can bring his qualities. He's a young lad who is starting every game for Tottenham, that shows how good he is," Guedioura told BBC Sport. "When he joined us for the first time we tried to welcome him as a brother because the national team is a kind of family. "Hopefully he's going to do well for us." 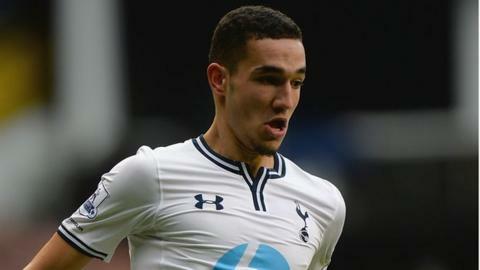 Bentaleb made his Premier League debut as a substitute in Tim Sherwood's first game in charge, a 3-2 victory at Southampton, and has since made made 19 appearances. That has led to international recognition for the teenager and he looks set to be heading to Brazil this summer as part of the Algeria squad. "When you play in the Premier League it means you have the experience to play in big games," added Guedioura, who plays for Crystal Palace and is the only other Algerian international currently with an English top-flight side. "I know when you play in the national team it's quite different and of course we're talking about the World Cup but I think he's doing really well and we're going to be there for him." Algeria's Adlene Guedioura on playing for Crystal Palace and his hopes for the World Cup in Brazil this year. Algeria have been drawn in Group H at this year's tournament, where they will face Belgium, South Korea and Russia. The Desert Foxes competed at the 2010 finals in South Africa, drawing 0-0 with England and losing their other two group games 1-0 to Slovenia and the United States. Guedioura was in the squad in South Africa and is hoping that this time around they'll qualify for the second round. "It's going to be historical if we can do it but it's going to be tough because we have tough teams and really big teams in our group. We're going to prepare ourselves well to be there," he said. "We have an ambitious coach and we're not going there to be tourists. "We'll go there with confidence and even though we want to enjoy it, enjoying it means winning as well."